“The Jewish Trinity – When Rabbis Believed in the Father, Son and Holy Spirit” by Yoel Natan. Aventine Press, LLC., Chula vista, CA. 2003. At 358 pages, this Pb book has some heft. 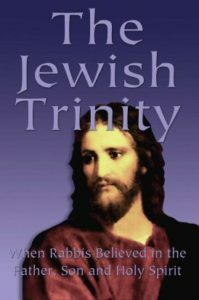 There is a Foreword by the author, a Glossary and Abbreviations, and a synopsis of “The Jewish Trinity.” Ten chapters follow, then four hefty Appendices, fifteen pages of Endnotes, and an Index of two pages. $19.95. Sad to write it, but my computer is of an age that it will not “download” a digital copy of the book as offered on Yoel Natan’s website free of charge. Perhaps you can find a way to do this for yourself. Merely listing the titles of the chapters ought to give you a hint at the exhaustive completeness and scholarly precision of this work. I have read many authors who provided only a representative sample of proofs for the Trinity. Such casual and incomplete treatment of the subject provides the erroneous conventional wisdom that the Tanakh only hints that there are Persons of YHWH. Natan not only provides clear and exhaustive evidence that Moses, and other writers in the Tanakh, wrote strikingly and often, both about the Trinity and the deity of the Messiah, the author also struggles with and refutes anti-Trinitarian so-called evidence. As Natan indicates, the Old Testament is as explicit about the Trinity and deity of the Messiah as is the New Testament. If ever you have wished for a text that illustrates fully the fact that the entire Tanakh witnesses to the Holy Trinity and to the deity of Christ Jesus, God in the flesh of the Messiah, this is the book for you. If ever you have wanted to help an adult class through the turmoil of grappling with anti-Trinitarian so-called evidence in the Bible, or if you want to help serious catechetical age seekers find for themselves the plethora of passages that demonstrate that the One God of the Hebrew Scriptures is the LORD Messiah Jesus, Son of God and son of Mary; then, this text is for you. Remember what Luke wrote of the Risen Lord Jesus in his Emmaus Road tale, “25 And he said to them, “O foolish ones, and slow of heart to believe all that the prophets have spoken!26 Was it not necessary that the Christ should suffer these things and enter into his glory?” 27 And beginning with Moses and all the Prophets, he interpreted to them in all the Scriptures the things concerning himself.” [ESV] Please, consider this paperback your textbook. I find only three serious things to say negatively about the book. Foremost among these is something my pastor mentioned. Natan does not quote rabbis who have wrestled with this issue. It is hard to imagine that no rabbi has struggled with this issue. Natan mentions Maimonides, but does not present details of the great rabbi’s reasoning. Moses used the Hebrew word “echad” in the Shema to describe God as a “united one.” Maimonides clearly substitutes “yachid” for “echad” to describe God as “alone,” when he so diligently prepares the Masoretic Text compilation. Natan shows how the Christian terms, Father, Son, Holy Spirit do fit the text received from Moses and others in the Tanakh. He never claims those terms were explicitly used by the rabbis prior to the formulation of the Nicene Creed. Parallel to this is Natan’s interesting use of the term “proof,” and his argument for it. Forget what you learned in Elementary Plane Geometry; QED does not signify here. Finally, I admit this latter point is more of a quibble than a character flaw in the book; I found it annoying, but have used Natan’s Latinization of the Hebrew font above to illustrate what I mean. Natan does not make use of the beautiful Hebrew and Greek fonts we pastors learned to read in seminary. Get the book. Read the book. Do not believe you are doing your job as a witness to the Risen Lord Jesus unless you also have at least read what Natan supplies: an interpretation to others in all the Scriptures the things concerning the LORD Messiah Jesus. If you can remember all these points that matter; then, you’ve a younger, fully alert, more powerful memory than is available to me. I have recommended this book for our local free public library’s collection. I recommend it to you with most high praise.